After a fruitful collegiate career that included two conference titles and a NEC Tournament MVP award, Troy Scribner went undrafted out of Sacred Heart. Five years later, he is living the Big League dream. Scribner, who was an AAA All-Star for the Salt Lake City Bees earlier this summer, joined the Angels during their weekend series in Toronto and saw action in the first game following his activation. Coming out of the bullpen to start the sixth inning of a 3-3 game, Scribner fanned the first batter he faced (Kendrys Morales) before running in some trouble. After a single by Steve Pearce and a line out from Ezeqiel Carrera, Miguel Montero offered at an 0-1 change-up from Scribner and sent it over the wall for a two-out, two-run homer. Following another single, Scribner struck out Ryan Goins looking to end his first MLB inning. Despite being tagged for three hits, including a two-run bomb, Scribner kept his composure and proceeded to retire seven batters in a row, including Jose Bautista and Josh Donaldson during a 1-2-3 seventh inning. 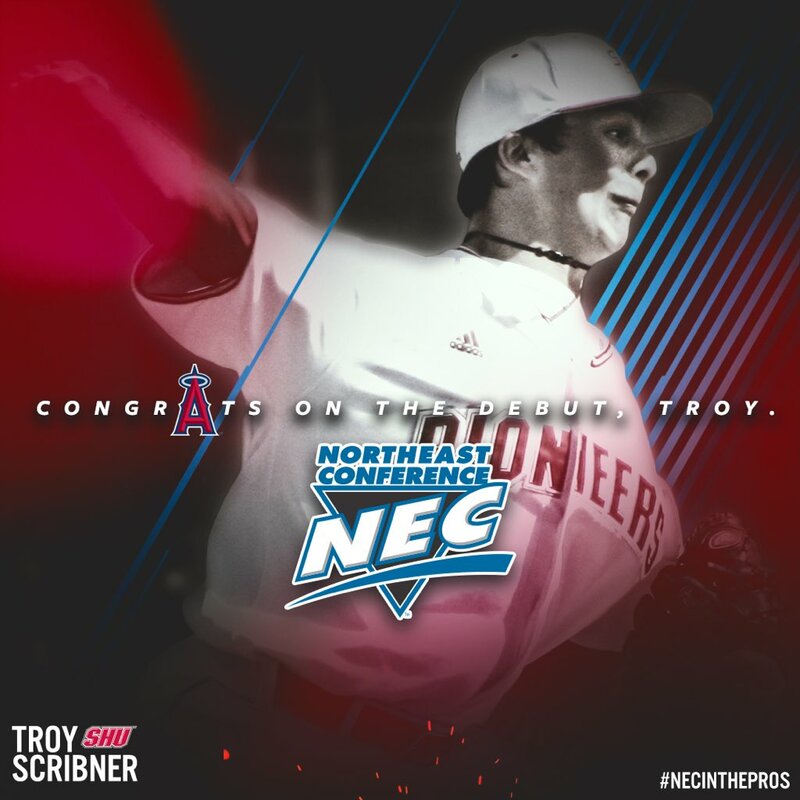 Current Seattle Mariners’ relief pitcher Evan Scribner is Troy’s older brother and he also played his college baseball in the Northeast Conference. Competing for Central Connecticut, the elder Scribner pitched his way onto the 2006 All-NEC First Team and was selected by the Arizona Diamondbacks in Round 28 of the 2007 MLB Draft. Scribner, who is in his seventh season as a Big Leaguers, is currently on the 60-day disabled list. He was a member of the 2012 AL West Champion Oakland A’s and pitched 2.0 scoreless innings in the postseason (ALDS). Today the #Angels have designated INF Nick Frankin for assignment. Club has selected contract of RHP Troy Scribner. 2017: Triple-A All-Star & MLB debut!